Throughout the course of her career, Stefani Germanotta (aka Lady Gaga) has surprised her fans time and again with her creative vision and show-stopping talent. A Star Is Born, in which she starred as nightclub singer-songwriter Ally Mane, has now been nominated for a slew of Golden Globe awards, including a Best Song nomination for “Shallow.” The track is a breathtaking duet with co-star and director Bradley Cooper which has also garnered four Grammy nominations. 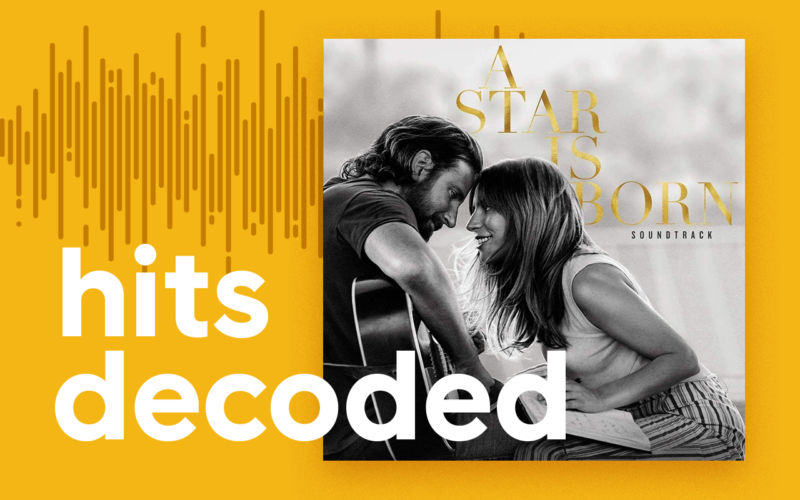 Let’s take a look at three production choices that make “Shallow” so powerful in the context of the film: the lyrics, instrumentation, and arrangement. SPOILER ALERT: This piece discusses some of the plot of A Star Is Born. If you haven’t seen it yet, please read on at your own discretion. The repetition of this lyrical and melodic motif mirrors how the characters complement each other: as Ally tries to support Jack in his struggle with alcoholism, Jack uses his platform to propel her to stardom. Each character’s struggle as alluded to in the song is reflected in the film’s edits: when Jack sings, “Or do you need more?,” we see Ally taking out the trash from the kitchen where she works. When Ally sings the same line in the second verse, the camera is sharing a limo backseat with Jack as he escapes his adoring fans to steal a drink. Double meanings abound here: “falling,” “crash,” “meet the ground,” “dive” – all of these ‘downer’ words could refer to one of the main themes of the film: falling in love and succumbing to personal demons. Even these smallest of lyrical choices are calculated to generate suspense by foreshadowing both stars’ story arcs. The instrumentation choices in “Shallow” are made specifically to complement the lyrical content and highlight the performers’ voices. The first verse’s arrangement is sparse; Jack’s guitar and voice are the only sounds featured. This choice clearly highlights Jack’s stardom, cementing his position as the established veteran artist. When Ally takes the stage for her verse, a few string and piano flourishes add some color, but the full band doesn’t chime in until she croons a building bridge that’s so natural that it could be improvised. Once the full duet is unveiled in the final chorus, the electric guitar and drum kit are playing unison stabs, accentuating the vocal harmonies like fireworks going off at the stadium where Jack and Ally are performing. There’s no synth pad here filling out the arrangement, no drum samples or effects. Even the band remains restrained so that the powerful lyrical content and vocal counterpoint can shine. A less subtle arranger may have written a key change or blowout guitar solo, but that’s not the point of the movie. The point is that we’re seeing a star being born, and stars don’t let themselves get upstaged by their lead guitarists. The arrangement of “Shallow” dovetails beautifully with the edits to the film, as noted by Cassidy. As Jack croons the first verse, directed at Ally, memories of Ally’s blue-collar lifestyle show how Jack built Ally up, reinforcing her confidence and eventually inviting her onstage at the Greek to continue the ballad. The powerful two-part vocal harmony of the second half of the chorus (“In the shallow, shallow…”) is accentuated by Cassidy’s reverse two-shot edit. Here, finally, are two stars truly supporting each other, mirroring the film’s storyline. The song ends on a slightly ominous note, however, as the last thing we hear is Jack strumming an Em chord. The minor-key tonality, stripped of the leading-tone 7th we hear in the first chord of the song, makes the chord feel final, but foreshadows Jack’s eventual downfall.